In this tutorial I’ll show you how to make Ubuntu bootable USB from iso and then install Ubuntu 13.10 Saucy Salamander on your computer from it. Ubuntu 13.10 is scheduled to be released on October 17th 2013. So far it’s in Alpha stage. The daily build iso can be downloaded at here, and final release will be available at this page. USB at least 1GB. Format it to FAT32 (uncheck ‘Quick Format’). Computer running with any operating system. 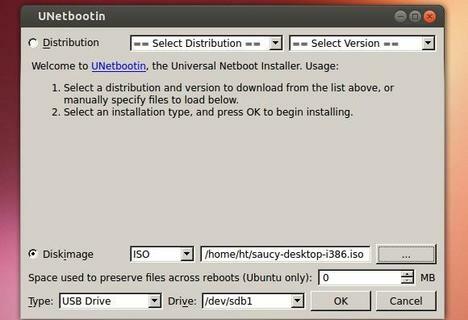 To get started, download Unetbootin, which is a simple tool that allows Windows / Linux / Mac OS users to create bootable Live USB drives for Ubuntu, Fedora, and other Linux distributions without burning a CD. It’s available for downloading at this page. 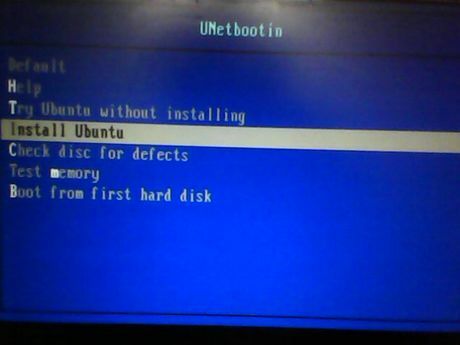 Insert your USB stick into your computer and then open Unetbootin executable. Check “Diskimage” and choose the Ubuntu 13.10 iso file from your Computer. You USB drive should be selected automatically. Click on OK to start. When it is done, click Exit. i am using google chrome acer c7. 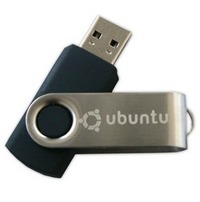 as bios is efi how can i install ubuntu 13.10 from usb on than laptop. is Unetbootin will work on that. if not then what tool will. i heard that ubuntu 13.10 will come with kernel 9.12 or something that which will support chromebook. but can i make bootable usb or may it will be download and install from net as 12.04 and 13.04 do directly. Tried 13.10 with LILI USB and the virtual machine froze at initramfs I suppose I’ll have to wait until LILI supports it.